Description: OpenSS7 References SIGTRAN Stack References. Here you will find documentation for the following SIGTRAN Signalling User Adaptation Layers and related SS7 over IP information. SCTP is an IP transport designed for transporting signalling information over an IP network. This is a collection of RFCs and Intenet-Drafts for SCTP. SCTP is an integral part of the OpenSS7 SIGTRAN stack. OpenSS7 also has several implementations of SCTP that are independent of the SIGTRAN stack. This is a collection of Internet-Drafts and RFCs that apply to several or all the Signaling User Adaptation Layers. There are also UA extension drafts here. The SCTP RFCs and drafts are also located here. The OpenSS7 SIGTRAN stack implements all of the extensions listed here. TUA is an SS7 Signalling User Adaptation Layer for providing TCAP-User signalling over SCTP. TUA is intended to be used on a Provider/User basis where TCAP resides on a Signalling Gateway (SG) and TCAP Users reside on an Application Server (AS). TUA is an integral part of the OpenSS7 SIGTRAN stack. SUA is an SS7 Signalling User Adaptation Layer for providing SCCP-User signalling over SCTP. SUA is intended to be used on a Provider/User basis where SCCP resides on a Signalling Gateway (SG) and SCCP Users reside on an Application Server (AS). SUA is an integral part of the OpenSS7 SIGTRAN stack. ISUA is an SS7 Signalling User Adaptation Layer for providing ISUP-User signalling over SCTP. ISUA is intended to be used on a Provider/User basis where ISUP resides on a Signalling Gateway (SG) and ISUP call control applications reside on an Application Server (AS). ISUA is an integral part of the OpenSS7 SIGTRAN stack. M3UA is an SS7 Signalling User Adaptation Layer for providing MTP-User signalling over SCTP. M3UA is intented to be used on a Provider/User basis where MTP Level 3 resides on a Signalling Gateway (SG) and MTP Users reside on an Application Server (AS). M3UA is an integral part of the OpenSS7 SIGTRAN stack. M2UA is an SS7 Signalling User Adaptation Layer for providing Signalling Links interface over SCTP. 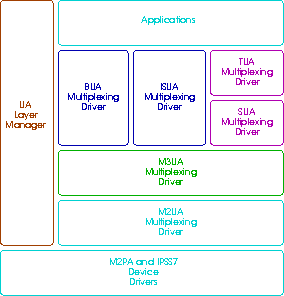 M2UA is intended to be used on a Provider/User basis where MTP Level 2 resides on a Signalling Gateway (SG) and MTP Level 3 resides on an Application Server (AS). It is not intended for peer-to-peer operation: that is, it is not intended to emulate a signalling link between two SCTP endpoints. For peer-to-peer operation, see M2PA, below. M2UA is an integral part of the OpenSS7 SIGTRAN stack. M2PA is an SS7 Signalling User Adaptation Layer for providing SS7 signalling links over SCTP. M2PA is intented to be used on a Peer-to-Peer basis and replace the functionality provided by a traditional SS7 link. M2PA is an OpenSS7 Network Device. IUA is an ISDN Signalling User Adaptation Layer for providing ISDN signalling over SCTP. Also included here are drafts for DUA, GR303-UA, V5UA and a number of ISDN related RFCs and Internet-Drafts. IUA is an integral part of the OpenSS7 SIGTRAN stack. TALI is Tekelec's Transport Adapter Layer Interface for providing MTP, SCCP and ISUP signalling over TCP and SCTP. TALI is an integral part of the OpenSS7 SIGTRAN stack. IPlink is an old draft for providing SS7 Signalling Links over UDP. SS7/IP is an OpenSS7 Network Device. This is a collection of Internet-Drafts and RFCs that apply to several or all of the Signalling User Adaptation Layers. There are also UA extension drafts here. The SCTP RFCs and drafts are also located here. The OpenSS7 SIGTRAN Stack implements all of the extensions listed here.